The Infamous Stringdusters now have a festival of their own The Festy. Taking place at Devil's Backbone Brewing Company in the beautiful mountains of Nelson County Va. With two stages set up allowing for music flow all day long into the wee hour of the night. With The Infamous Stringdusters being the host of the first annual event they hand picked the incredible line-up. 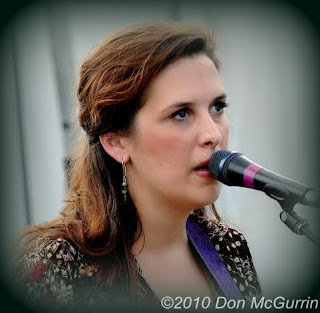 Starting with Sarah Siskind who kicked it off, too Toubab Krewe who closed it out on Sunday night. The list in-between is just as exciting. Pantheburn, Tress on Fire, Yarn,Misty Strings,Morwenna Lasko & Jpun Quaretet,Town Mountian,Packway Handle Band,Robinella,Crooked Still,Old School Freight Train,Tony Rice Unit,Railroad Earth,The Devon Sproule & Paul Curreri Band,Larry Keel & Natural Bridge,Josh Ritter & The Love Canon String Band and two nights of The Infamous Stringdusters. Other activities included morning yoga classes, massage therapists, rock climbing wall. There were music workshops as well as a zero-waste workshop and composting. There were morning runs and mountain bike races. A fantastic group of food venders as well. So mark your calendar for October 8 & 9 2011 for the 2nd annual Festy.